It's not only about the obvious journey. It's also about the inner one. 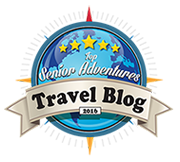 It's about the pace, the mode, the style, the economics of senior travel. It's about the lessons of earlier cruising lifestyles applied to travels past 70. It’s a far cry from the feeling we had driving down to Mazatlan. Yes, those urinals we bought will be of utterly no use. As a matter of fact, we felt confident enough that we even took a different route. We followed the advice given to us by a couple we met in El Cid who had been driving the route for years. This route is so much better because it divides the trip more evenly to 6.5-6-5.5 hours. The previous one we took was 8-6-4. (Both include border times.) We also bypass Los Mochis, Sinaloa the city with Level 4, the highest crime level according to the US State Department Advisory (our trip down was uneventful, too, but we were so cautious). Saying goodbye to all the friends we had made in the three months we were in Mazatlan was not easy. We hugged lots and reminded ourselves that we would be seeing each other again on January 4, 2020. I gave copies of my book, Carolina: Cruising to an American Dream, and boxes of chocolates. Packing all the things we brought with us and all the things we bought in Mazatlan was not easy either. But, on the morning of April 1, 2019, we drove our car north on Mexico 15 D, the Cuota freeway. I delighted at the burst of yellows along the way on an early Spring Day. We also stopped at inexpensive Mexican pottery stores. The first stop of our three-day road trip was Navojoa. It is the fifth-largest city (population, over 150,000) in the state of Sonora just past the state of Sinaloa where Mazatlan is located. The Mexican Revolutionary Álvaro Obregón was born in Hacienda Siquisiva in the small town near the city. After the 1910 revolt, he became the President of Mexico, introducing modern agricultural techniques. He made the Valley one of the most prosperous agricultural regions in Mexico. Today, aside from agriculture, foreign as well as local investors have gone into many industries like shrimp farming, swine production, recycled containerboard and box making, and a Tecate brewery (recently acquired from Heineken). The Valley exports mainly to the US because of its close proximity to the border. The colorful Navojoa signage stands out at the roundabout as you enter the city. Prosperity is evident and we had time to take pictures of the Main Plaza fronting the Palacio Municipal. Four monuments surround the Plaza and the City Clock Tower donated by the Rotary Club leads to it from the main thoroughfare, Mexico 15 D. The Cathedral is just a block away, its spires visible from the Plaza. 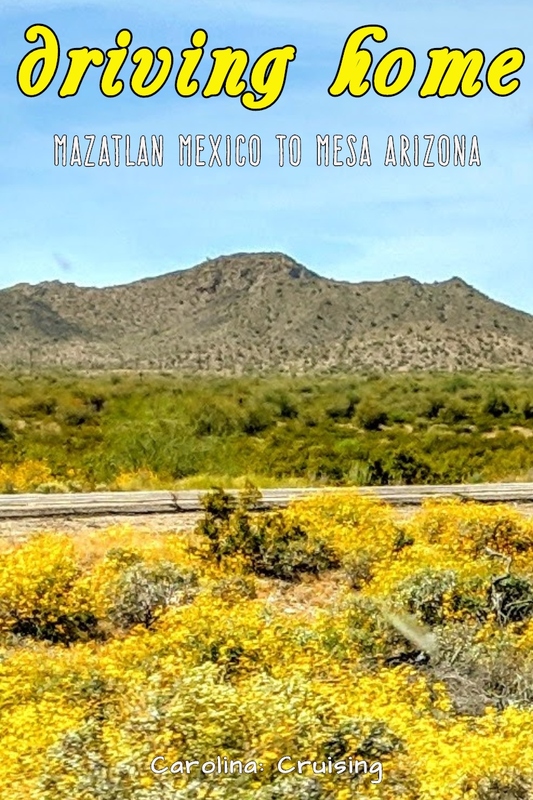 The next stop should have been Santa Ana, about six hours from Navojoa and a little over 60 miles south of Nogales on the US border. Santa Ana is a small city with a population of just over 10,000 known for raising cattle with over 20,000 head exported to the US annually. The movie The Fast and The Furious was filmed there throughout the months of June and July 2008, as well as the larger town of Magdalena de Kino (population, 25,000). Hotels.com did not have available hotels in Santa Ana so we booked at Magdalena de Kino which is even closer to the Mexico-U.S. border. When I researched the city, I found out that it is a Pueblo Mágico, one of 83 towns selected for scenic, cultural or historical qualities. We loved our stay at the 5-star Hotel Industria, one of six hotels in the city. It is just a half block away from the Main Plaza. The remains of Father Francisco Eusebio Kino, the pioneer Roman Catholic missionary who founded fifteen missions in the area as well as Arizona was discovered in this town in 1966, 255 years after his death. A monument with a crypt housing his remains and a chapel with his effigy lying down are both in the Plaza. The city is named after him and the patron saint Santa Maria Magdalena. There is a pretty temple/church built in her honor also at the Plaza. The border was only a little over an hour from our hotel. This time we went through the correct crossing called Mariposa. It is right after Km 21 where we surrendered our auto permit that refunded our US$400. However, we forgot to surrender our visitors’ permit. We will have to find out how to do that by mail. The wait at the US border was a whole hour and our car didn’t have to be inspected by the US Customs border agents. After realizing that we had forgotten to surrender our permits we passed by the Mexican Consulate in Tucson. But we were told they didn’t have an immigration office there and we either had to go back to the border or forget about it. We wanted to make sure we would be given reentry to Mexico next year but we definitely didn’t want to go back to the border. We lost our appetite for lunch and continued on to Viewpoint. We simply said we will stop at the first McDonalds we spot. Would you believe we didn’t see any? We left Magdalena de Kino at 8 am and we arrived home at 2:15 pm. We will find out if we can mail our visa permit to the Immigration Office. By next year, we will have all the border processes down pat. So, yes, we will drive down to Mazatlan again next year, if they’ll let us! Thank you very much for nominating me! Of course, I would like to join in! Many thanks for dtodropp by! Sounds like you had an excellent drive back home to the US. Though too bad about failing to surrender your visitor’s permit. I wouldn’t want to drive back to the border too either if it was me. A little pimple on an otherwise great drive. I am glad that you felt much better on your drive back home from Mazatlan. The stop in Mavajoa looks like fun. I am sure it was a great relief to find the right crossing on the way home. Hope you can mail your immigration papers back! Yes, we fo hope so!!! Glad you've made it home safe and sound. Those yellow flowers everywhere must have helped with the long drive. And I'm sure the 5-star hotel in Magdalena de Kino made it easier too! I hope you get your papers sorted for next year! Saying good bye to your third home must have been hard. I haven't driven over the border before but it seems crazy. Such a beautiful drive though. We hope they never close it!!! We wish, too and are thinking positive! You have learned so much during you journey to and from Mazatlan! Sounds like you got caught in some of the current border/immigration issues. Let's hope it gets more organized by the time you return next year. I hope so, too! We learn! 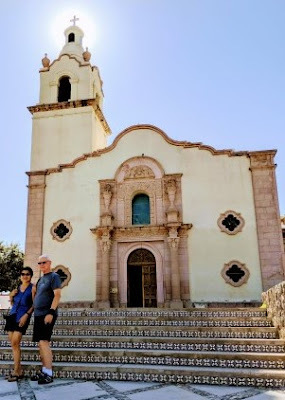 We spent several months on the Baja and found ourselves missing mainland Mexico - the cities and towns on Baja lack the grand central squares you see on the mainland. 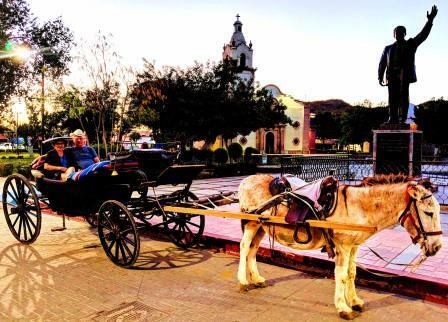 Your photos and mention of the public squares made me think of how much we missed those in Baja. Mazatlan will always be a favorite of ours. 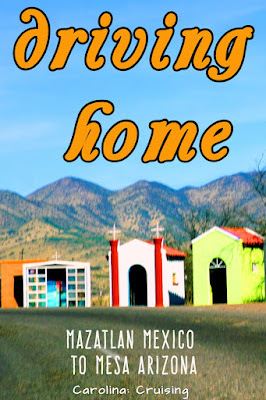 Indeed, Sinaloa has it's share of crime, but we spent a few days in Los Mochis awaiting the Copper Canyon train and we had a great time there. On the way to Mazatlan, we spent a night in Los Mochi's, too! Yes,cwe live these Swuares. But we found them in San Jose del Cabo! You've had quite the journey and it sounds like you have also learned so much along the way. I hope you can get your border paperwork all straightened out so it won't be as much of a hassle for your next trip. It's always nice to come home. Nice that everything has worked out! Generally,yes and looking forward to next year! So glad to see your visit to Mexico ended well. What an amazing winter you two had. We hope you eventually get your $400 deposit back. We did! Looking forward to next year already! That's a beautiful detour and a colorful city! A lot of surprises come from this unexpected road trips!! That's why we love road trips! Having read about your adventures in Mazatlan, it must've been a wrench to leave. But great that you can return next year (well, hopefully, as long as you find a way to return those permits!). Visas and border crossings are always a minefield of organisation! We are sure to get it right 100& next year! 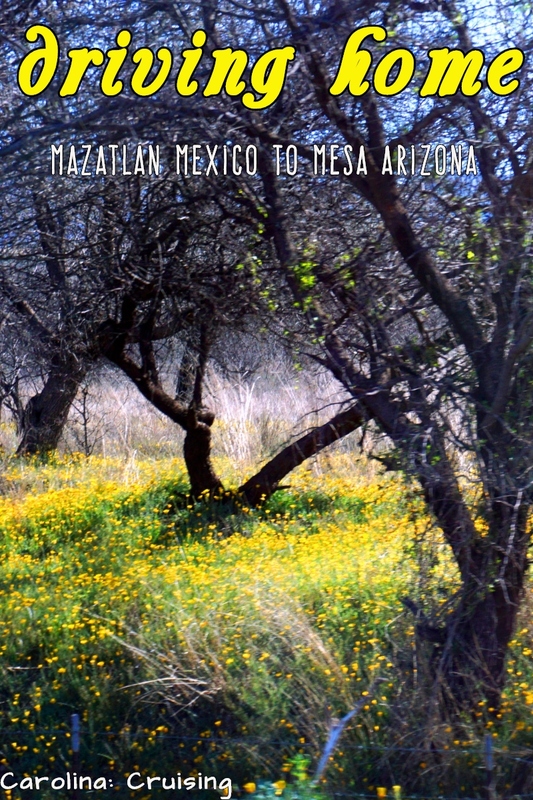 I've never visited Mazatlan or taken a road trip through Mexico but your tips and pics make me want to go. One hour to cross the border seems very quick, though I suppose the wait time can vary a lot. You stop in Santa Ana looks like a happy diversion from the original plan. It was a good trip back home, much better than the drive down. That's a pain that you forgot to surrender your visitor passes. Hope you find a way to give them back to help facilitate your trip next year. 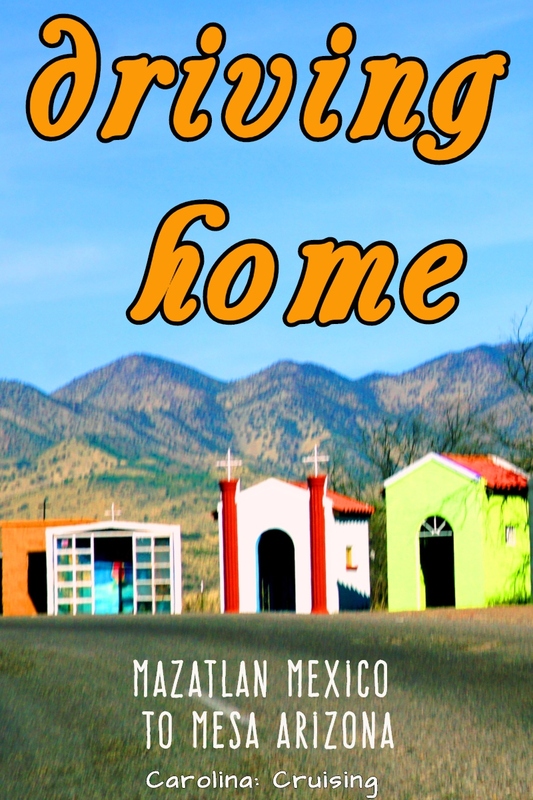 Sounds like you really planted roots down in Mazatlan I've enjoyed reading your article about your experiences. Glad you had a safe trip back. Thanks. Yes, Mazatlan is now my third home. Just not sure I want to visit Mexico on the ground these days, especially with my own vehicle. Too much hassle at the border. So I'm glad to hear from you that it's not as bad as I imagined. However, still gonna fly. We plan to still drive next year. That may be our last. It's always fun to take a different route back and good that you bypassed Los Mochis, I haven't heard of this place but doesn't sound very pleasant if it has been rated as Level 4 for the highest crime. I love the colorful Navojoa sign at the entrance of the city. Never been to Mexico myself, lucky that you can return because you live so close by! Yes, just a 15-hr drive plus border time. You give me too much honor! With all your ups and downs, you still seem to have had a lot of fun. It was a good idea to take a different route back for these are the experiences that have made wonderful memories. I hope you have started planning for your next adventure. Looking forward to the same. Oh, yes. The next one is a 6-week road trip thru 8 states/provinces. That was a big pleasant surprise! Navojoa looks nice. There should be a way to mail them your permits. Otherwise, what should people do who lost their documents somewhere or have them stolen for instance? Anyway, we really hope you'll get to reenter Mexico next year! Yes, I think there is a way! It must have been hard to say good-bye to everyone! What a marvellous place to spend the winter. Those border crossings can be so tricky and there are so many different things to think about. Fingers crossed you can mail your visitors visa back. Keep us posted! I am sure we can! Thanks! It's so easy to take the familiar road, but it's so true that taking new roads make you discover new gems, extend into unfamiliar territories, and many times to fun encounters! What a story about the border crossing and the visa permit! Hopefully all will be well next year's crossing! It's crazy how sometimes "simple" things are not that simple. We have done many land border crossing in our trip in Central Asia, and they are all different! Patience, patience, and more patience! Yes, we did well in choosing a different route but did not know enough about what to do at the border! Lessons learned. We traveled about 100,000 miles to 49 American states, 9 Canadian provinces, and 6 Mexican states in almost 5 years. This book offers fascinating facts, surprising insights, and useful guides. 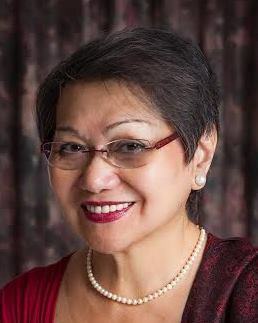 But it is also a story of retirement, immigration, and love. I discovered America from within the cozy confines of an RV. Not only did I learn to be a wife without losing my identity, but also became an American without losing my roots. Trending in Last 30 Days! WOW: Traveling Light, in an RV?